This post is written by Kumbirai Ivyne Mateva, LINK’18 Runner Up for Best PGR Presenter and PhD student from the School of Biosciences. The true essence of being a student lies in generating useful, innovative and detailed research. One interesting belief to which I fully subscribe is the idea that as a postgraduate research (PGR) student your scholastic obligations to your community are never fully discharged if you fail to effectively communicate and disseminate your research to others. Therefore, effective presentation skills are a key skill which a wholesome postgraduate student ought to develop. Being the runner up for Best PGR Presenter in this year’s edition of LINK Conference has been one of the most rewarding experiences of my postgraduate student journey this year. Contrary to popular belief, winning the prize money was not the best part of participating in this year’s conference. Rather, I cherish the privilege of having improved my public speaking and presentation skills through the arduous but richly rewarding process of preparation and participation. The greatest pay off one can receive in participating in such an event is growing and expanding on your capabilities and this is only possible through the lessons taught by stepping out of your comfort zone. In addition to presenting and receiving feedback on my research, I particularly enjoyed listening to talks given by my peers. This left me with a renewed interest in the power of research to help make our communities a better place. It was very enlightening to hear what fellow students are busy with in their own research and I was very much entertained by the diversity of work which were the subject of their presentations. One of the most important tips I would recommend to prospective participants is that they should take advantage of the Graduate School skills training courses on offer to postgraduate students. I attended two courses on presentation skills weeks before the conference and I attribute some of my success in effective presentation to this. The courses helped sharpen my resolve to be a better speaker by providing critical information about how effective presentations ought to be structured. In addition, the courses provided a friendly environment in which I could challenge myself to practise speaking and be evaluated by my peers and other professionals. After all, practice is well-known to make perfect when properly applied. It was indeed a high privilege to have had the opportunity to participate and I would unreservedly do it again if I ever had the chance. 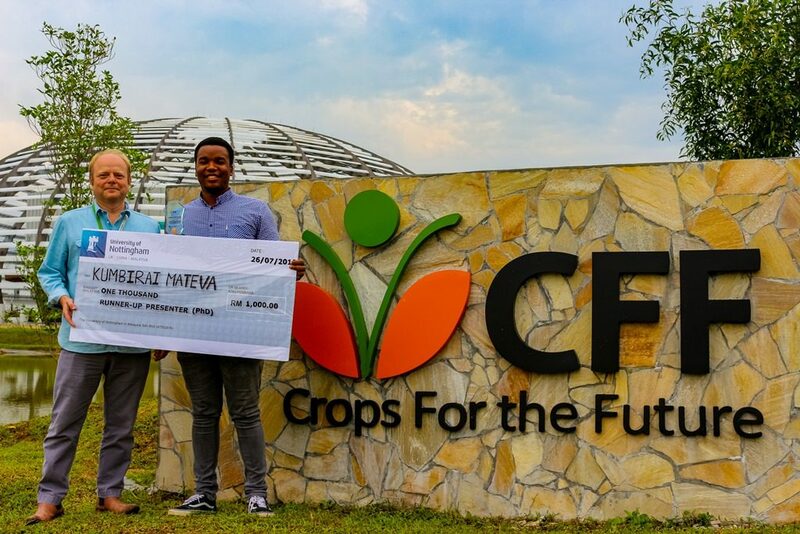 [From left] Dr Sean Mayes, Associate Professor in Crop Genetics at the Faculty of Science; and Kumbirai Ivyne Mateva. 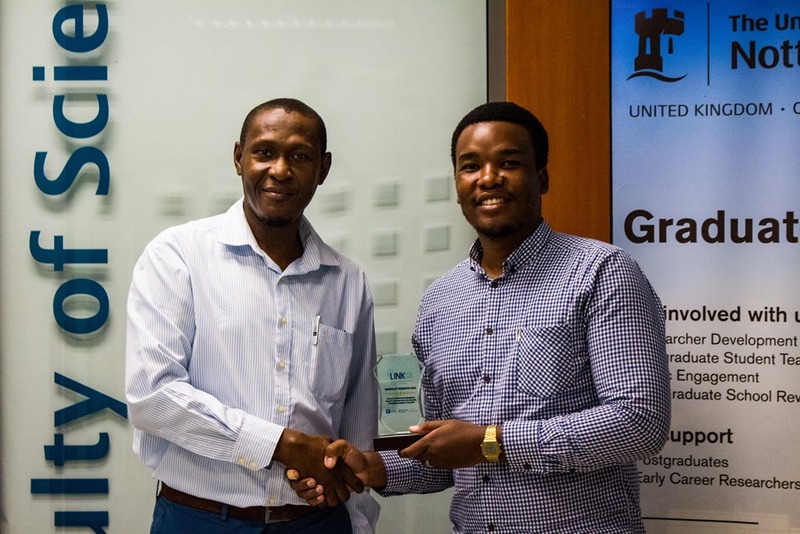 Kumbirai Ivyne Mateva was announced as the Runner Up for Best PGR Presenter for his presentation titled “Root System and Architecture in Bambara Groundnut (Vigna subterranea (L.) Verdc.) Genotypes” at the LINK’18 Conference held on 26 July 2018. Kumbirai Ivyne’s presentation described research on root morphological and 2D-architecture traits of Bambara groundnut to provide the basis for breeding new varieties with suitable root traits for the efficient acquisition of soil resources and adaptation to drought. Read more about the LINK’18 Conference. Read more about the winners of LINK’18 Conference. Featured image: [From left] Professor Nashiru Billa, Faculty Associate Dean of Research for Science; and Kumbirai Ivyne Mateva.